We appreciate the fact that every dog is different. 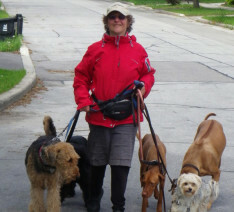 So whether your dog is rambunctious, shy, elderly, unfriendly around others, or anywhere in between, we work with you to establish a walking program that suits your dog’s specific needs. The goal of these walks is for you and your dog to feel confident in every situation you encounter together so knowing your requirements is extremely important to us.